Atlanta, GA, July 7, 2009 – As a recognized expert in identity verification solutions, IDology, Inc. announces its official launch into the lead verification market. Lead generation without verification can be a risky venture for any organization. 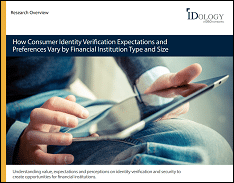 Proper verification validates that a person is real and detects if identity characteristics such as address or phone number match the person being verified. In turn, a company can make quick decisions on how to handle that lead, either approving the person right then, or passing along the consumer’s information for a sales representative to pursue. This official launch is supported with clients already using IDology’s ID verification solutions to verify leads, including DMS Research, a division of Internet-giant AOL, which relies on IDology to verify consumers before allowing them to join an online market research panel. Chuck Miller, General Manager of DMS, has seen the difference ID verification has on data quality. By making its presence in the lead verification market official, IDology is expanding its marketing focus. As part of the expansion, IDology is distributing a free whitepaper to educate marketers on the value of lead verification. “Converting Leads into Profitable Sales: 5 Reasons Why Lead Verification Works” presents the benefits of lead verification while highlighting valid points to consider when selecting a provider. While it is easy for companies to waste hours and resources going after false or duplicate leads, solutions do exist to eliminate the challenge. This paper explains how strong lead verification drives revenue, creates strong demographic reporting and ultimately lowers sales costs. Since it was founded in 2003, IDology has successfully applied its identity verification solutions to hundreds of organizations including those in the financial services, healthcare, insurance, telecommunications and retail industries. IDology, Inc provides real-time technology solutions that verify an individual’s identity and age for anyone conducting business in consumer-not-present environments to help drive revenue, decrease costs and prevent fraud. What makes us different is that we do this in a way that builds more confidence with your customers – by protecting sensitive data and promoting consumer privacy. Founded in 2003, IDology is the only provider to offer an on-demand change management tool that allows client business-unit managers to control the entire proofing process, including within an integrated solution, without having to rely on internal IT resources or contact IDology’s customer service. For more information, visit www.idology.com or call 866-520-1234.